Monkeys Took My Jetpack » Blog Archive » Leopard Women of Venus! Josh’s latest project for Hex Games is finally done and ready for your enjoyment! Leopard Women of Venus is a QAGS supplemet co-written by MTMJ’s own Josh Burnett with Leighton (Laser Ponies) Connor and illustrated by the same along with Linday (A Friendly Game) Honsby. LWoV explores the bizarre worlds of Golden Age comic creator Fletcher Hanks. 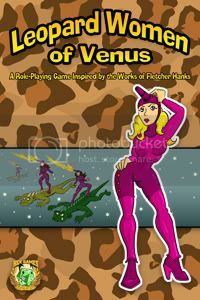 Leopard Women of Venus is a mind-melting pulp science fiction role-playing game inspired by the works of Fletcher Hanks. Hanks wrote and drew bizarre and memorable work in the earliest days of American comic books. His work is boldly drawn, frequently ugly, and strangely fascinating. Leopard Women of Venus gives you the tools you need to recreate the magic and lunacy of a Fletcher Hanks comic with your gaming group. Check it out, gang. I hope you enjoy it!